John Wayne was born Marion Mitchell Morrison, of Scotch-Irish descent, to Clyde and Mary Morrison on May 26, 1907, in Winterset, Iowa. He had one brother, Robert Emmet Morrison. He received his nickname "Duke" while still a child, because of his love for a dog of that name. His father was a pharmacist whose business ventures did not succeed. In 1914, when Duke was six, the family moved to California where his father was able to open a drugstore. In 1926 his parents were divorced. From the age of twelve Duke helped his father at his drugstore in his spare time. He also supported himself with a variety of odd jobs, including stints as a delivery boy and as a trucker's helper. At first he aspired to attend the Naval Academy and become a naval officer but things did not work out as planned. Fortunately, he was a star football player on the Glendale High School team, and he was accepted at the University of Southern California on a football scholarship. But an accident soon ended his playing career and scholarship. Without funds to support himself, he left the university in 1927 after two years there. In college Duke worked at the Fox studio lots in Los Angeles, California, as a laborer, prop boy, and extra. While doing so he met director John Ford (1895–1973), who took an interest in him (and would over the years have a major impact on his career). In 1928, after working at various odd jobs for some months, he was again employed at the Fox studios, mostly as a laborer but also as an extra and bit player. His efforts generally went unbilled, but he did receive his first screen credit as Duke Morrison. Wayne's first real break came in 1929, when through the intervention of Ford he was cast as the lead in a major Fox production, the Western movie The Big Trail. According to some biographers, Fox executives found his name inappropriate and changed it to John Wayne, the last name being taken from the American Revolutionary general "Mad Anthony" Wayne. The Big Trail was not a success and Fox soon dropped Wayne. During the 1930s he worked at various studios, mostly those on what was known as "Poverty Row." Wayne appeared in over fifty feature films and serials, mostly Westerns. He even appeared in some films as "Singing Sandy." Tall, likeable, able to do his own stunts, it appeared that he was doomed to be a leading player in low-budget films. However, thanks to Ford, with whom Wayne had remained friends, he was cast as the lead in the director's film Stagecoach, a 1939 Western that became a hit and a classic. This film was a turning point in Wayne's career. And although it took time for him to develop the mythic-hero image which propelled him to the top of the box office chart, he was voted by movie exhibitors as one of the Top Ten box office attractions of the year—a position he maintained for twenty-three of the next twenty-four years. Wayne appeared in over seventy-five films between 1939 and 1976 when The Shootist, his last film, a Western, was released. In the vast majority of these films he was a man of action, be it in the American West or in U.S. wars of the twentieth century. As an actor he had a marvelous sense of timing and of his own persona, but comedy was not his specialty. Action was the essence of his films. Indeed, critics have repeatedly emphasized the manner in which he represented a particular kind of "American Spirit." As a box-office superstar Wayne had his choice of roles and vehicles, but he chose to remain with the types of films he knew best. As the years passed his only admission to age was from the roles he played. He went from wooing leading ladies, such as Marlene Dietrich (1901–1992) ( Pittsburgh, 1942), Gail Russell ( Angel and the Badman, 1947), and Patricia Neal ( Operation Pacific, 1951) to more mature roles as a rowdy father figure ( McClintock, 1963), an older brother ( The Sons of Katie Elder, 1965), and a kind marshal ( Rio Lobo, 1970). Wayne's politics were not always right-of-center, but in the latter part of his life he became known for his anticommunism (a political theory where goods and services are owned and distributed by a strong central government) activities. His conservatism began in the mid-1940s. He served as head of the anticommunist Motion Picture Alliance for the Preservation of American Ideals; supported various conservative Republican politicians, including Barry Goldwater and Richard Nixon (1913–1994); and spoke out forcefully on behalf of various causes such as American participation in the Vietnam War (1955–75; when American forces aided South Vietnam with their struggle against North Vietnam). Wayne's politics also influenced his activities as a producer and director. Wayne's production companies made all kinds of films, but among them were Big Jim McClain (1951), in which he starred as a process server for the House Un-American Activities Committee fighting communists in Hawaii, and Blood Alley (1955), in which he played an American who helps a village to escape from the Communist Chinese mainland to Formosa. The two films that Wayne directed also are representative of his politics: The Alamo (1960) is an epic film about a heroic last stand by a group of Texans in their fight for independence against Mexico and included some preaching by the Wayne character about democracy as he saw it; and The Green Berets (1968), in which Wayne played a colonel leading troops against the North Vietnamese, which was an outspoken vehicle in support of America's role in the war. Wayne was married three times. He had four daughters and three sons by two of his wives (Josephine Saenez, 1933–1945, and Pilar Palette Weldy, after 1954). His second wife was Esperanza Diaz Ceballos Morrison (1946–1954). 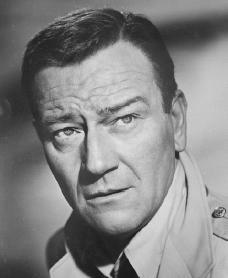 Wayne was the recipient of many awards during his career, including an Oscar for his role as the hard-drinking, one-eyed, tough law man in True Grit (1969) and an Academy Award nomination for his playing of the career marine in Sands of Iwo Jima (1949). Plagued by various illnesses during the last few years of his life, he publicly announced his triumph over lung cancer in 1964. But a form of that disease eventually claimed his life on June 11, 1979. Davis, Ronald L. Duke: The Life and Image of John Wayne. Norman: University of Oklahoma Press, 1998. Levy, Emanuel. John Wayne: Prophet of the American Way of Life. Metuchen, NJ: Scarecrow Press, 1988. McGhee, Richard D. John Wayne: Actor, Artist, Hero. Jefferson, NC: McFarland, 1990. Roberts, Randy, and James S. Olson. John Wayne: American. New York: Free Press, 1995. Shepherd, Donald, and Robert Slatzer with Dave Grayson. Duke: The Life and Times of John Wayne. Garden City, NY: Doubleday, 1985.